Bailey visited Cats Protection’s Bridgend Adoption Centre in Bryncethin. 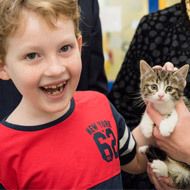 An inspirational little boy who won an award for carrying out '100 acts of kindness' has donated £250 of his prize money to Cats Protection. Eight-year-old Bailey Sloan from Barry won Rotary International’s Young Citizen Award in recognition of his many kind deeds which included leaving chocolate on doorsteps, presenting passers by with roses, and clearing litter from the beach. Bailey, who is on the autistic spectrum and suffers from ADHD, was awarded with a trophy and £500 to split between his chosen charities Cats Protection and homeless charity, Llamau. “I chose to give to Cats Protection because I adore and care for cats, they are adorable creatures and kindness is magic,” said Bailey. Last Monday (25 April) Bailey visited Cats Protection’s Bridgend Adoption Centre in Bryncethin to hand over the cheque and meet some of the abandoned and unwanted cats that will benefit from his generosity. With three moggies of his own, Bailey also spent time talking to staff about his own cats named Pink Loveheart, Ginger Beauty and Mog. “It was a true privilege to meet such an inspirational boy like Bailey and we absolutely loved having him here. We gave him a tour of the centre so he could see for himself how his kind donation will be put to use,” said centre manager Sue Dobbs. “I was very touched by Bailey’s 100 random acts of kindness. He is very enthusiastic and has an obvious passion for cats, something which came across during his visit to the centre. We feel honoured that we were one of his chosen charities to receive part of his prize money for winning his Young Citizen Award,” she added. To find out more about Bailey’s 100 acts of kindness, visit his YouTube video at https://youtu.be/nKwMqOEuHIo.